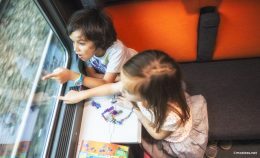 If you are travelling with more than one child under 4 years old per accompanying adult, you need to book a bed or a couchette for each of them. Children between the ages of 4 (as of the date of their fourth birthday) and 14 (the day before their fifteenth birthday) must have their own couchette or bed. Therefore, you must book them a place on board the train as you will for an adult. Children with booked places share the same advantages as adults (luggage allowance, comfort,…. ).